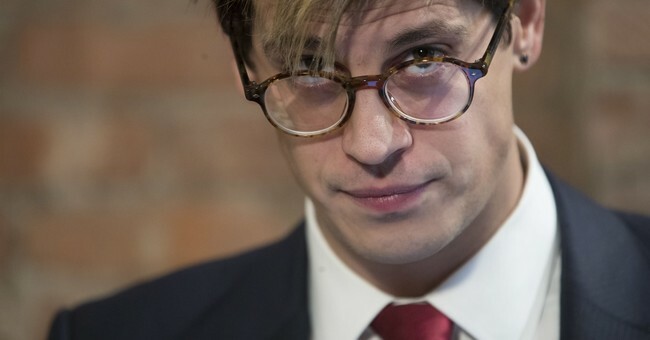 Former Breitbart editor Milo Yiannopoulos' visa application was denied by Australia's Department of Home Affairs because of his character, The Sydney Morning Herald reported. The decision was made based off an incident in which Yiannopoulos allegedly sent $14.88 via PayPal to a Jew. According to the Morning Herald the number 1488 has significance. It's supposedly used by white supremacists and neo-Nazis because "14" represents the mantra of securing a future for white children and "88" represents "Heil Hitler." Immigration officials reportedly sent a letter to Yiannopoulos, letting him know about the decision, which appears to be permanent. In the letter, immigration officials reminded the conservative provocateur that they can – and will – deny anyone they fill will "incite discord in the Australian community or in a segment of that community." • Despite the locations of your previous appearances being withheld by the organisers until 24 hours prior to the events, there were significant protests at both the Sydney and Melbourne events. The protest at the Melbourne event involved violence between those protesting and your supporters. You were issued with a bill of $50,000 by Victoria Police for the cost of policing your event. The last time Yiannopoulos visited Australian, back in 2017, a riot broke out. Two were arrested and five police officers were injured. He was subsequently charged a $50,000 fine. Yiannopoulos is not the first controversial figure the Australian government has barred from entering the country. WikiLeaks whistleblower Chelsea Manning, Proud Boys leader Gavin McInnes and English conspiracy theorist David Icke have also had their visa application denied.